Hi, I have some old lego Technic sets, numbers 854, 870 871 and 875. As far as I can tell they are all complete. I can't find any sets online to give a rough idea on price to sell for, if anyone has any idea of what I should be looking to achieve, be it peanuts or pounds id be greatful. Once I know I'll be happy to post a separate for sale post if anyone is interested. You need to get familiar with Bricklink. Here is pricing on #854. 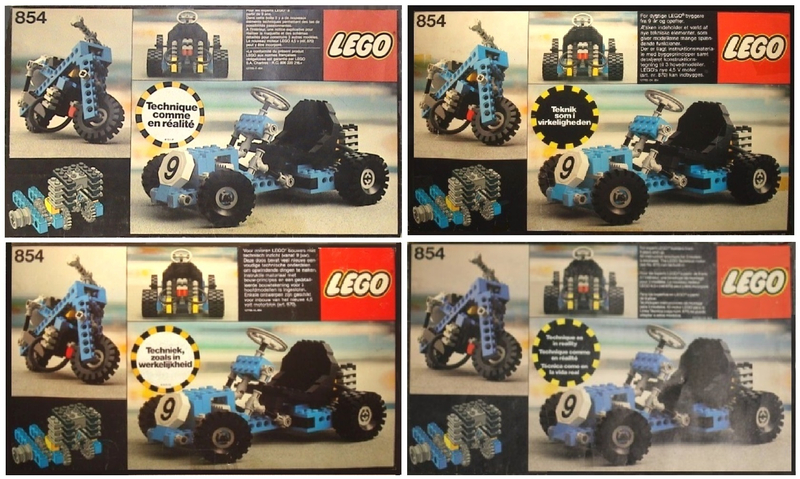 Are all of your 8xx series of Technic sets from the UK (in English)? They made these early Technic sets in different languages, and some are rarer than others.... here's a sample of some of the languages. Upper left... French... upper right Danish... lower left Dutch... these all date to 1977-79. Starting in 1980 they tripled up on languages, and the lower right one is English, French, Italian.